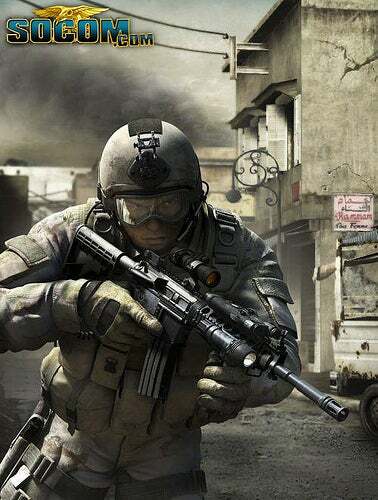 David "Pointman" Brothers dropped a bunch of new screens for upcoming Playstation 3 shooter SOCOM Confrontations this week over on the SOCOM site, he also added a bit of commentary to a few. Check out the jump for details on some of the screens taking from the Crossroads and Urban Wasteland maps. I can't wait till this game hits, looks like it's going to be a total blast. Three on one? All's fair in love and war. I'm a huge fan of architecture and the way cities look. I took a trip to New York City a couple weeks ago and came home with more pictures of random buildings and streets than I did of the actual thing I went there to see. So, there's a lot for me to like in this one screen. The way that the tile gives way to basic dirt, the street lamps, and the brick work are all pushing my buttons over here. It's pretty cool, isn't it? Do you see that lion in the background, just to the left of center? If you wanted to, you could travel all the way over there. Same thing with the tall building in the center, and the rooftops to the left, front, and center. Two more bits. First, if you have a proper weapon, you can snipe from this position and pick people off from across the map. Second, do you see the birds flying in the air? You can shoot them. We don't encourage that sort of thing, and you're really better off shooting at the enemy, but hey... you can shoot them. This is an image from the same angle as the post from the other day, but a bit lower to the ground and more detailed. You can see some things that were blocked or covered before. The bicycle, the garbage bags (there are two), and the fuel can, for example. There's even a transformer on the electrical tower. For those of you who don't speak French, "Bain pour hommes" translates to, "Men's Bath." This is a shot from Urban Wasteland. We can get a good look at the wrecked building, and can probably figure out some decent working strategies for this specific point. There are pretty clearly four levels at work here— the beginning of the stairs (off-screen), the first landing, the second landing (off-screen to the left and top), and then the walkway in the top right. It seems like it'd be pretty easy to pick people off from any level of the staircase, which means that you've got to stay on your toes when ascending or descending. The real question is what's in the rooms that the staircase comes from and goes to?